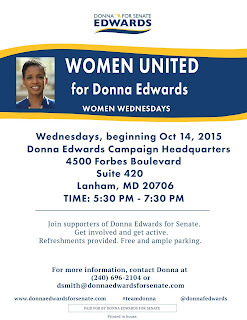 It is official, my good friend Donna Edwards has asked me to chair the Maryland Women for Donna, I am excited and ready to help elect her as our next U. S. Senator the link below will introduce you to her statewide constituent chairs. We are ready to start working! Beginning this Wednesday, October 14, 2015 the campaign office will be open every Wednesday from 5:30pm through 7:30pm so that we can start calling Marylanders and let them know that Donna is running and she needs their VOTE on April 26, 201 6. 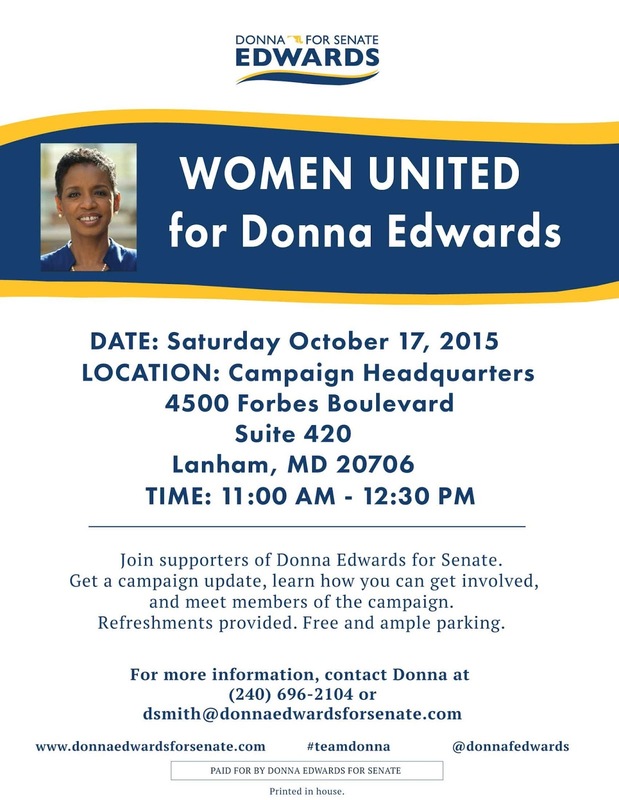 The campaign office is located at 4500 Forbes Boulevard, Suite 450. THERE IS PLENTY OF FREE PARKING AND WE WILL ALWAYS PROVIDE REFRESHMENTS! 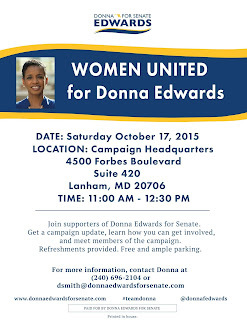 On Saturday, October 17, 2015 there will be a brief WOMEN UNITED for Donna meeting from 11:00 - 12:30 pm at the campaign headquarters which is located at 4500 Forbes Boulevard, Suite 420, Lanham, Maryland 20706. PLEASE FEEL FREE TO SHARE THIS INFORMATION TO GET INVOLVED WITH YOUR NETWORK.